The weather is warming up in Calgary and we’re ready to welcome spring! At University District, we can’t wait to see the crocus blooming and lily of the valley flowering in our nearby parks and gardens. Soon after, it will be time to revel in the long summer days under our prairie-blue skies. For now, we’re counting down to spring break, only weeks away, but a great opportunity to spend time with family and friends, or downtime for yourself, and explore the city. Mark your calendar for fun times ahead and start to plan now, filling those days with rewarding activities that are educational, athletic, entertaining and more. To stay atop of unique local events and activities, here are some recommendations we have that can’t be missed. Whatever you’re interested in, it’s easy to enjoy a staycation in style in Northwest Calgary! Stay ahead of the game to take advantage of these great local options and invite others to take a break with you from the bustles of work or school routines. Spring really has sprung in our neighbouring communities with fun activities that will spark your creativity, fuel your energy, and prepare you for a summer state-of-mind. Keep reading to see what unique recommendations to enjoy on our doorstep! At University District, we embrace creativity and personal touches in and around our homes. Whether it’s a charming topiary planter on your porch or an original watercolour above your fireplace, character and celebration of individuality makes a house homey. To nurture that unique sense of place that distinguishes your style, why not turn to local talent? Here are three upcoming exhibitions and shows to explore for decor inspiration and unique shopping options with a delightful Calgary twist. Artistic talent abounds in our city and there may be no more meaningful way to recognize young artists than by acquiring one of their original works at the Alberta University of the Arts (formerly Alberta College of Art and Design) Students’ Association semi-annual student art market, Show + Sale. On March 28 and 29, you can visit the campus to peruse as many as 3,000 artful pieces — prints, drawings, fibre art, sculpture, ceramics and more — with proceeds from purchases raising valued funds for important student programming and to support the artists directly. The creative energy from the campuses close to U/D is palpable. Why not adorn your home with the work of a talented student? For more information, visit: acadsa.ca/show-sale/. Saturday, April 6, take a trip to the Dalhousie Community Centre to browse the works of the Calgary Sketch Club members during a free exhibition where everyone is welcome. Visit any time between 10 am and 4 pm to meet the artists and build your collection of original works. If you are interested in exploring your own creative side, inquire about membership and maybe your work will be on show next year! Make April 12 and 13 the days you set the stage for a perfectly decorated personal space. Discover locally crafted goods — from pottery to limited-edition prints and more. The Curated Market is a two-day market-style shopping experience for one-of-a-kind, handcrafted treasures. For just $4 admission, deals on gems are yours to be found at the Bowness Community Association. Entertainment, food trucks and free admission for kids 12 and under, too! The stylish finds by carefully chosen exhibitors make shopping a treat. Looking to plan an entire day out? Check out our creative day itineraries that might inspire you to fill your schedule during spring break. From dates to friendly outings, you won’t be disappointed! Cultural highlights in and around the Northwest range from multi-disciplinary and edgy young talent to classic works by seasoned professionals. Whatever your fancy, top talent is taking to the stage in and around University District and is sure to delight! These events are happening in venues so close to home, it would be a shame to miss out on the fun! Saxophonist Brian Scanlon is set to perform with the UCalgary Jazz Orchestra on March 25 at 8 pm at University Theatre. If his name is new to you, his music is likely familiar. You may have heard him on the soundtracks for popular films Monster’s Inc., A Bug’s Life and Moulin Rouge. March 28 – April 10, witness first-hand the creative brilliance of University of Calgary School of Creative and Performing Arts students. During Alchemy19, their new, exciting and proud works across all disciplines are on show. From drama and dance to readings and recitals, performances range from free admission to $13 per ticket. An inspiring, 90-minute live orchestral performance in concert at the Southern Alberta Jubilee Auditorium is being staged April 25. This not-to-be-missed event features National Geographic natural history footage combined with original symphony music created by Emmy- and BAFTA-nominated Bleeding Fingers Music. Experience a musical journey through some of the world’s most incredible wildlife spectacles with a live orchestra and choir. What goes better with a live performance than dinner and dessert? Do you have a favourite local haunt to visit before or after a night of entertainment? Check out some of our beloved hot spots in our NW guide. Stay on your A-game this spring as more and more outdoor activities are made available for you to prepare for this year’s upcoming marathons, hiking in the backcountry, and cycling through Calgary’s best pathways and trails. The popular saying “be ready to be ready” is fitting for sports and adventure enthusiasts and it’s time to prep for those outdoor adventures as the weather warms up. Also watch for our upcoming feature with local business NOMAD Gear Rentals for some NW biking tips and trips! 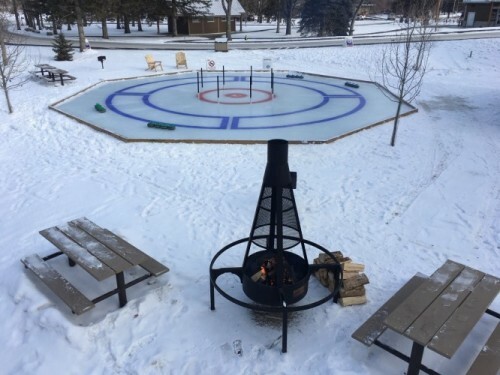 Crokicurl is a uniquely Calgary creation now available only at Bowness Park! Creekside rings of ice and frozen steel posts set the stage for Crokicurl, the new made-up game by Bowness Park staff. Read more about how fun this unique game came to be, courtesy of the City of Calgary, and head down to the park to try it for yourself. In about two months, the Paddle Station re-opens for the season to help make Calgary kayaking and rafting accessible and fun. Want to get some paddling practice in? The University of Calgary pool has an open recreation session available on March 19 where you can use their gear to strengthen your paddling skills. Sign up now and get those arms moving! Itching to get out and play? Playgrounds around the city are starting to see the snow melt, and it’s time to discover play time again, no matter what your age is. Take a look here for the top NW playgrounds that the entire family can enjoy! Spring break is a good mental break for parents and kids, and a great time to enjoy a week or two together. Time to start planning for the summer though! Prepare for the summer with planned activities during the break to keep them happy and occupied while meeting new friends and discovering new skills. A rite of passage for many young people, take a look at some of our NW Calgary options so you’re ready for the summer camp season. There are as many fascinating themed camps as you can imagine hosted at the University of Calgary that are thought-provoking, fun and bonding for kids of all ages. There is a Veterinary Medicine Camp on a farm that includes hands-on work with dogs and horses. There is a music video camp using GoPro cinematography, editing, camera angles and shooting techniques that conclude with a red carpet and popcorn film festival in a private theatre. University of Calgary summer camps spots are already filling up fast! Click here for the line-up of sporting, educational and fun options for kids of all ages. Whether the little one in your life is an active gamer or a young triathlete, Mini-U camps have you covered! At University District, we’re a community where an active lifestyle and cultural appreciation harmonize. What events are on your must-do list for spring? Share your favourites and capture video or images to be shared with us on Facebook, Instagram and Twitter, or leave a comment below. Have a spring activity we missed from the list? Share your activity suggestion with us and the community on Facebook, Instagram and Twitter.